Xray rooms vary in design, depending on their purpose. For example, a room dedicated to upright chest radiography might not have an xray table because the patients in this room would be standing for their examinations, not lying down. A room designed for doing gastrointestinal examinations would be equipped for both radiography and fluoroscopy. A typical room designed for general radiography is suitable for many different types of xray examinations. In a hospital setting, the room will be fairly large, perhaps 18 x 20 feet in size, with wide doors to accommodate hospital beds and stretchers. Physical features will include the radiographic table, the xray tube and its support system, an upright image receptor cabinet against one wall, and a shielded control booth that contains the control console. The xray tube is the source of radiation. Modern multipurpose xray tube are dual focus tubes. Their cathode assemblies contain two filaments, one large and one small. It situated in the focusing cup that directs its electrons toward the same general area on the target portion of the anode. When the small filament is activated, its electron are directed to a tiny focal spot on the target. The small filament and focal spot provide finer image detail when a relatively small exposure is appropriate, for example, when imaging a small body part such as a toe or wrist. The large filament provides more electrons and is aimed at a larger target area. The combination of large filament and large focal spot is used when a large exposure is required, such as for radiographs of the lumbar spine or the abdomen, because the large filament provides more electrons and the large focal spot can better handle the resulting heat at the anode. The anode is disk-shaped and rotates during the exposure, distributing the anode heat over a larger area and increasing the heat capacity of the tube. It is the rotation of the anode that causes the whirring sound just before and after the exposure. The xray tube is located inside a protective barel-shaped housing. The housing incorporates shielding that absorbs radiation that is not a part of the useful xray beam. The housing protects and insulates the xray tube itself while providing a base for attachment that allows radiographer to manipulate the xray tube and to control the size and shape of the xray beam. The tube housing may either be attached to a ceiling mount tube hanger or mounted on a tube stand. Both type of mountings provide support and mobility for the tube. A tube hanger is suspended from ceiling on a system of tracks to allow positioning of the tube at locations throughout the room. This ceiling mount is useful when positioning the tube over a stretcher or when moving the tube for use in different locations. A tube stand is a vertical support with a horizontal arm that supports the tube over the radiographic table. The tube stand rolls along a track that is secured to the floor (and sometimes also the ceiling or wall), permitting horizontal motion. A system of electric locks holds the tube support in position. The control system for all, or most, of these locks is an attachment on the front of the tube housing. To move the tube in any direction, the locking device must be released. Moving the tube without first releasing the lock may damage the lock, making it impossible to secure the tube in position. Do not attempt to move the tube without first releasing the appropriate lock. Roll (tilt, angle)- permits angulation of the tube along the longitudinal axis and also allows the tube to be aimed at the wall rather than the table. A detent is a special mechanism that tends to stop a moving part in a specific location. Detents are built into tube supports to facilitate placement at standard locations. For example, a vertical detent will indicate when the distance from tube to image receptor is 40 inches, a common standard distance. Other detents provide “stop” when the transverse tube position is centered to the table and when the tilt motion is such that the central ray is perpendicular to the table or to the upright image receptor cabinet against the wall. Another attachment to the tube housing is the collimator, a boxlike device mounted beneath the port, the opening of the housing. Collimators allow the radiographer to vary the size of the radiation field and to indicate with a light beam the size, location, and center of the field. There is usually a centering light that also helps align the image receptor. Controls on the front of the collimator allow the radiographer to adjust the size of each dimension of the radiation field. The collimator has a scale that indicates each dimension of the field at specific source-image distances. A timer controls the collimator light, turning it off after a certain length of time, usually 30 seconds. This helps to avoid accidental overheating of the unit by prolonged use of its high intensity light. While many collimators are manually controlled, some are equipped with a feature called positive beam limitation (PBL). These collimators have sensors that detect the size of the image receptor. Some automatically adjust the radiation field size to the size of the image receptor; others prevent exposure until the field has been manually adjusted to the size of the image receptor or smaller. These PBL devices were legally required, for reasons of radiation safety, to be installed on machines manufactured, moved, sold, or significantly upgraded during the years between 1970 and 1993. This requirement no longer exists, but many collimators with PBL features are still in use. The radiographic table is a specialized unit that is more than just a support for the patient. While the table is usually secured to the floor, it may be capable of several types of motion: vertical, tilt, and floating tabletop. For vertical table motion, a hydraulic motor, activated by a hand, foot, or knee switch, raises or lowers the height of the table. This allows lowering of the table so that the patient can sit down on it easily and also permits the table to rise to a comfortable working height for the radiographer. Adjustment to exact stretcher height can be made to facilitate patient transfers. There will be a detent or standard position for routine radiography. This standard table height corresponds to indicated distances from the xray tube. Because it is important that standard tube/IR distances be used, it is necessary to return the table to the detent position after lowering it for patient access. Not all table are capable of vertical motion. A tilting table also uses a hydraulic motor to change position. In this case, the table turns on a central axis to attain a vertical position. This allows the patient to be placed in a horizontal or vertical position or at any angle in between. The table may also tilt in the opposite direction, allowing the patient’s head to be lowered at least 15 degrees into the Trendelenburg position. A detent stops the table in the horizontal position. Tilting is an essential feature of most fluoroscopic tables and may also be a feature of a radiographic unit. Special attachment for the tilting table including a footboard and a shoulder guard to provide safety for the patient when tilting the table. Pay particular attention to the attachment mechanism so that you will be able to apply these attachments correctly when needed. Before tilting a patient on the table, always test the footboard or shoulder guard to be certain that it is securely attached. The motor that tilts the table is quite powerful and can overcome the resistance of obstacle placed in the way. Many step stool and other pieces of movable equipment have been damaged because they were under the end of the table and out of view when the table motor was activated. Such a collision can also damage the table motor. Be certain that the spaces under the head and foot of the table are clear before activating the tilt motor. A floating tabletop allows the top of the table to move independently of the remainder of the table for ease in aligning the patient to the xray tube and the image receptor. This motion may involve a mechanical release, allowing the radiographer to shift the position of the tabletop, or the movement may be power-assisted, activated by a small control pad with directional switches. Power assisted movement is common for fluoroscopic table. When primary radiation encounters matter, such as the patient or the xray table, the resulting interaction produces scatter radiation. 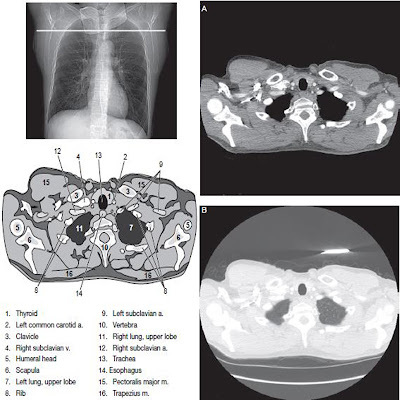 Most of the scatter radiation produced during an exposure originates within the patient. This scatter radiation causes fog on the radiographic image, a generalized exposure that compromises the visibility of the anatomic structures. Grids and buckys are devices to prevent scatter radiation from reaching the image receptor and degrading the image. A bucky is usually located beneath the table surface. It is a moving grid device that incorporates a tray that holds the Image receptor. The entire unit can be moved along the length of the table and locked into position where desired. The grid that is incorporated into the bucky device is situated between the tabletop and the image receptor. It is a plate made of tissue-thin lead strip, mounted on edge, with radiolucent interspacing material. The strips must be carefully aligned to the path of the primary xray beam, so precise alignment of the xray tube is essential. In most radiographic units, the grid moves during the exposure. The purpose of moving the grid is to blur the image of the thin lead strips so that they are not visible on the radiograph. When the table has a floating tabletop, the bucky mechanism and image receptor do not move with the tabletop. Stationary grids that do not move during the exposure serve the same purpose as a bucky. A grid may also be incorporated into a device called a grid cap, which is a grid mounted in a frame that can be attached to the front of an image receptor for mobile radiography and other special applications. Grid or bucky are generally used only for body parts that measure more than 10 to 12 cm in thickness. (The average adult’s neck or knee measures 12 cm). when a grid is not needed, the image receptor is placed on the tabletop. The upright bucky or the grid cabinet is a device that holds the image receptor in the upright position for radiography. It is adjustable in height and may incorporate either a bucky or a stationary grid. When a stationary grid is included, this device may be referred to as a grid cabinet; when the grid moves during the exposure, the device is called an upright bucky. Even when the table tilts to the upright position, it is common to have a separate upright unit for some examinations such as the cervical spine and the chest. When the patient is sitting or standing at the upright bucky, the tube is angled to direct the xray beam toward the image receptor. The distance may be adjusted to 40 or 72 inches, depending on the requirements of the procedure. Cables from the tube housing connect the xray tube to the transformer, which provides the high voltage necessary for xray production. Some transformers look like a large box or cabinet, which may or may not be located within the xray room. Newer transformer designs are much smaller and may be incorporated into the control console. The control console, located in the control booth, is the access point for the radiographer to determine the exposure factors and to initiate the exposure. kVp – controls the kilovoltage, and thereby the wavelength and penetrating power, of the xray beam.